Passport/Visa Requirements: US citizens do need a valid passport, but visas are not required for stays up to three months. If the thought of adventure travel inspires you to explore the allure of North Africa, Morocco is as culturally and geographically approachable a country as you're likely to find. Africa's primary gateway to Europe, the region historically represents a cultural and trade crossroad to the Western world. As captivating as its natural landscapes and as diverse as the people who inhabit it, Morocco has cast a spell over the collective imagination. The country has a marvelous coastline that stretches from the Atlantic Ocean to the Strait of Gibraltar. Farther inland, the High Atlas Mountains (considered home to the native Berber people) meet the edge of the Sahara. Morocco is the ideal place to immerse your family in the foreign. A fascinating mix of mosques, medinas, cafés and cabarets will captivate you in the exotic metropolises of Tangier, Marrakech and Casablanca. The enchanting cities of Fez and Rabat will instantly transport you back to an ancient time. Splendid architecture, exceptional goods and distinctive people will be central to the experience throughout. In fact, with so much to do, boredom will be the only thing that's not on the agenda. 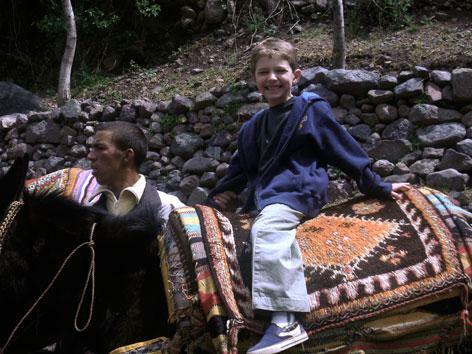 My kids loved this trip – especially riding camels and sandboarding on the Saharan dunes!